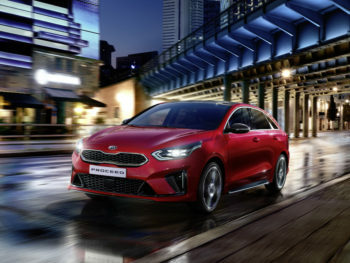 Kia has revealed its 2019 ProCeed model, which features a five-door ‘shooting brake’ estate bodystyle for increased practicality. Shown in full following the teaser image a fortnight ago, the new model moves away from the previous three-door hatch format to bring “stunning design with the space and versatility of a tourer”, as previewed by the Ceed Sportswagon concept at Geneva this spring. Explaining the rationale for the transformation, Gregory Guillaume, European head of design, said: “Europe’s shrinking market for three-door hatchbacks brought the future of the Procee’d in question. But it was equally inconceivable that we would simply kill off the Procee’d. It was not just the name we gave to our three-door cee’d. It embodies all Kia’s values of youthful dynamism, of emotional engagement, and of design-led desirability. Making its debut at the Paris Motor Show, the 2019 ProCeed will be sold alongside the new Ceed Sportswagon and uses the same wheelbase but the coupé-inspired body is lower and longer than both the Ceed five-door hatchback and Sportswagon. Boot space stands at 594 litres compared to 625 for the Sportswagon and the ProCeed also ditches the boot lip and brings a lower ride height than the Sportswagon. It also features 40:20:40 split-fold rear seats, folded with a single touch from a lever just inside the tailgate, and a flat boot floor. It will also be available exclusively as a ‘GT-Line’ or high-performance GT model, offering sportier exterior and interior styling. Three engines will be offered for the GT Line, including Kia’s 120hp 1.0-litre T-GDi (Turbocharged Gasoline Direct injection) petrol engine, its new 140hp 1.4-litre T-GDi unit and a new 136hp 1.6-litre common-rail diesel said to be the carmaker’s cleanest diesel engine to date. Both petrols offer a six-speed manual transmission as standard, while the 1.4-litre T-GDi and the diesel are also available with Kia’s seven-speed Dual-Clutch Transmission. The GT model is powered by a 204hp 1.6-litre T-GDi engine also seen in the Ceed GT and featuring Kia’s new seven-speed dual-clutch transmission. Standard safety technologies will include High Beam Assist, Driver Attention Warning, Lane Keeping Assist with Forward Collision-Avoidance Assist. Production of the ProCeed shooting brake begins in November, and sales commence exclusively across Europe in the first quarter of 2019. Full specification, pricing and on-sale date will be announced in due course.